*tsk tsk tsk. You gotta give yourself time to recover. Out of curiosity, do they give you a set of exercises to do for your recovery period? I was wondering considering how hard the surgery was on you, if they did something like that. No, they just told me the more active I am the faster I will heal. They know I’m a runner, and were adamant about not running before I was healed enough (and believe me, I have no desire to run at the moment) but they did say walking was the best exercise post-surgery. They had me up and walking the day after surgery. I did some very easy yoga yesterday for the first time since surgery and it helped a lot. Resting so much has taken a toll on my back. Saw your blog on the NOCC site and read about your journey so far. Keep the faith…it does get better. At 52, I was diagnosed in February, 2012. Like you, I was/am very active and I think that actually helped me recover faster. I had the surgery to remove a grapefruit size tumor. I have a zipper belly but my scar looks amazing now. lol Fortunately, I was stage 1A. All my pathology came back clear. I had the chemo, too. I can totally identify with your comments about being surprisingly accepting and realistic. I didn’t lose it or have any ‘why me’ moments. I figured ‘why not me’. Nothing special about me to protect me from this dreadful disease. You are right, too, in that it is a gift in a way. The support and love that I received still overwelms me. I wonder how I will ever repay such an outpouring of love. We are blessed. I love your positive attitude and look forward to reading more. Bad diagnosis–excellent prognosis. You go!!!! Thanks so much for reaching out, Beverly. It’s so nice to hear from someone who’s been through almost exactly the same thing I’m going through. You are so right about ever repaying all the love and support I am receiving from my family and friends. I am so happy hearing how well you are doing. I have been accepting of my diagnosis, though I did have a rough weekend recently when I felt impatient, restless, and quite frankly, just plain tired of having cancer. It passed, though I’m sure there will be other days. Thanks for reading! You will get there! Let you body heal because as you said in an earlier post, it will be a battle still! Try some stretching or some things that make you feel active and remember set backs are normal. You’re doing great. I did some very easy yoga yesterday and today and it felt amazing to be doing something again. We also had a little cold front (low 90’s and low humidity) blow in, so I took a nice walk this evening. Thanks for your support! It does seem contrary but it can happen to anybody. You do and live a healthy living to side step thing like this. Like the old saying, I know I’m strong I am just tired of proving it over and over again. 🙂 Great pics! Looks like you had a great time! Thanks. I will prove how strong I am as many times as I have to! And anytime my running friends are around, it’s always a good time! Good to hear you talking this way! That said, I concur with the R&R you have earned. Heck, doing ultra’s even if you’d never undergone this particular physical endurance event, you’d have still earned R&R points. 2. Mentally entering into your body systems, imagining and willing your immune function to detect and respond to everything that should not be hanging around in your body, and for your healthy cells to draw up defenses in just the right measure to make your healing the most efficient, the most effective, and for the greatest purposes you can imagine yourself dedicated to on this side of existence. Movement…clarity…healing…purpose…mental, imaginative future running in the present…how is that possible? Spiritual too. Let us know, if you want, where you found yourself running! How with each stride, something else came to mind…maybe it will make your training journal, or, maybe a book, or, maybe it stays with you and yours. It’s all good. I look forward to reading all you have to write. I like that thing about bringing in your own food. During chemo, a number of friends and family in times past have said red hots or Lemonheads help during chemo..with people wearing Wonder Woman defecting bracelets and Lemonheads, you will prevail! I love that! I think I’m going to have to get a Wonder Woman t-shirt for chemo. i thought some of the best advice my husband got post-surgery was – listen to your body and understand what it is saying. it sounds like you are. I remember the set-backs my husband had after his brain surgery. it was a crazy game of – I feel good let me do everything – followed by – I feel like $hit now that I did all that – to – I can’t do anything – to – I feel great let me do everything and on and on and on. that lasted about six months before he could really listen to his body and understand what his body was telling him! one of the hardest parts of his recovery was learning to rest when he needed it and learning the new patterns of rest that he needed. i’m so happy to see you are up and about and that you are ready to face the challenges! yay you! Thanks for all your great advice, Monica, and thanks for all the support! AND CAN I BORROW YOUR AWESOME BLUE WIG??? I may need it soon! My very last chemo treatment will be on Halloween, can you believe it! I may have to come in costume that day! Again, my patience is pretty thin. I’m a very restless person, but yes, it will be SWEET when this is all over! Two steps forward, one step back…grrr…your type A personality doesn’t like that too much! Oh, my type A personality is used to this. It’s never satisfied and I will just get over it. I can be so impatient. 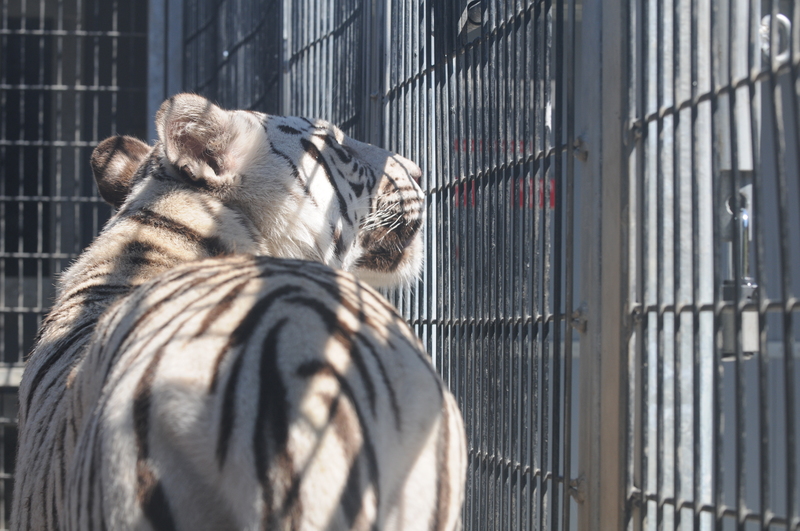 I can see how you’d feel like that beautiful, but caged, tiger. Being a runner sidelined for the moment must be driving you nuts! I know they are making amazing discoveries all the time with cancer. I guess now all that tiger energy must be directed inward, to healing and to courage. Good point, Melissa. I’ve been doing a lot of easy yoga and walking, and even some meditation, which has helped a lot. Patience is not one of my strengths! Staging … *raises my hand on the stage 2 thing* …though I believe I already mentioned that to you. I was told the same thing…that MOST are diagnosed in 3 or 4. Though…I was not far from that I believe. The silent … *shrugs* … does not want to go there. Oh, I almost forgot about that Gilda Radner book you mentioned to me. I think I will order it for my Kindle nod nods. Heyyyy, when we have BOTH whupped this thing, we should look into doing a Relay Tri …I wonder if they have some kind of cross-national event…that would be so cool. I’d take the swim leg and/or biking leg. I’ll give you the running one! Deal, Katie! Let’s make it happen. I’m definitely up for that. You can’t get the Gilda Radner book on Kindle, only in book form. It’s pretty cheap, though. I bet you could get it from your library, too. I picked up my anti-nausea meds today from the drugstore. I worry about nausea the most since I seem to be susceptible to that. You need to take care of yourself as well. Stay away from work until you’re ready, young lady! Logging your reaction to treatment and meds is a very good idea. Hang in there! Great that you had a wonderful day that included time with friends. Pacing is good, but on the other hand, don’t challenge time. TIME is the theme of the week, eh Frank? I will pace myself and rest when I need to. Thanks for the reminder. BTW … regarding the “why me” question. When you are ready for a tougher question, let me know. You know your body best and I am sure you will be back on the trails in no time! It will be awhile before I hit the trails again. I fall almost every trail run, so I’ve gotta steer clear of that! Stick with what you know, but also know that your mind is both your biggest enemy and your strongest asset. Be the Tiger — know when it’s time to fight and when it’s time to rest. Hang in there Sweetie! Another great quote: “Be the tiger.” That’s going to be my new mantra as I go into chemo. Thanks, Tania! Actually, Angela, your cancer is gone. They got the tumor and there was no evidence of metastases in any lymph nodes or adjacent organs. So the treatment will simply be to try to mop up any single, “out-of-control” remnant cells that might have broken free and could be floating around in your blood stream. That means your recovery probability is very high. Just be careful of your lungs, because some of these “mop-up” drugs can cause serious lung damage (in some individuals). If you have trouble breathing, let the docs know immediately. Thanks, Joanne. I know I am very fortunate, but chemo is rough. I’ll be glad when this is over. I am truly glad for your good news. Yes, cancer can happen to anyone. I wonder if it is happening more nowadays? I don’t know, have no idea, but it just seems to be everywhere. It’s horrific. I have wondered the same thing, or is it simply there are more people around than there was in the past? I do know the death rate has remained about the same. It also seems as if more younger women in their 20’s and 30’s are getting cancer than before. I’ll have to ask my doctor.